After hours of preparation, the time has finally come to deliver your speech in front of audience. Your opening is by far the most important moment in your performance. To be confident, enthusiastic and reduce your anxiety you should commence your speech by praising the Lord. 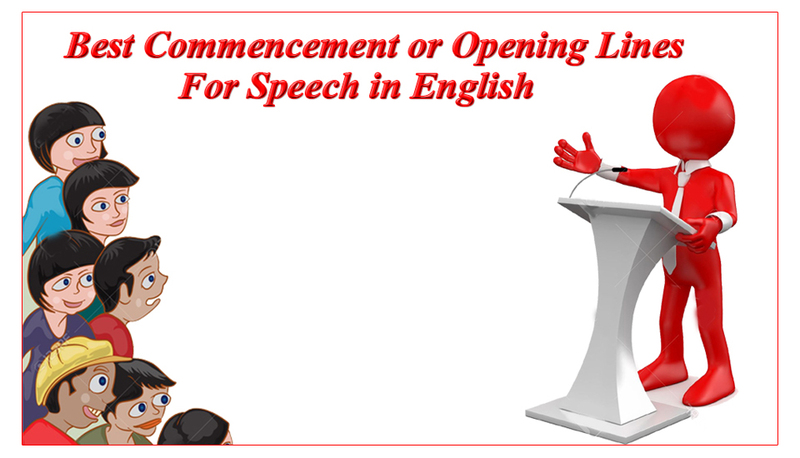 Below is a list of 5 best commencement or opening lines for speech in English which will make your speech more dynamic. Moreover you will find this lines useful: Anchoring Script. 1. To start with the greatest name of Almighty Allah. Most gracious and merciful, whose bounties are unbounded, whose benevolence is everlasting, whose blessings are uncountable, whose being is eternal, whose mercy is unlimited, whose provisions are un-ending, and whose Love is our life, whose worship is our faith. A warm good afternoon/evening/morning to all of you present here. My name is______________, and I am going to be speaking to you today about______. 2. To start with the greatest name of Almighty Allah. Who created the universe, the sun, the moon. Who runs the rivers, lakes, and who runs the clouds full of rain. We should be so proud, when we shout it to him out loud. We ask you to protect us against the evils and crimes. Hello and good evening/afternoon/morning everyone, today I am here to share my views about______. 3. O Allah the Almighty protect me and guide me to your love and mercy. Ya Allah don’t deprive me from beholding your beauty, O my Lord accept this please. There is nothing in my heart except Allah. Ladies and gentlemen, well come to the auspicious gathering my today’s agenda is to talk about______. 4. The sparkle of fire is the witness of your worth, the silent flounce of the water is witness of your softness. The rising of the sun in east and the sunset in the west is the witness of your rhythm, rhythmical movement of the moon is the witness of your perfection. My words, my soul are the witness of oneness of glory Allah whose glorification cannot be described in words. Hello and good evening/morning/afternoon ladies and gentleman, today the agenda which is before the house is about_______. 5. Allah, with Him is the knowledge of the Hour, He sends down the rain, and knows that which is in the wombs. No person knows what he will earn tomorrow, and no person knows in what land he will die. The knower of the unseen is Allah these are the keys of the unseen, whose knowledge Allah alone has kept for himself and no one else knows them unless Allah tells him about them. The knowledge of when the Hour will occur is not known to any Prophet who was sent or any angel who is close to Allah. Good morning/evening/afternoon to all of you present over here, today I am here share my views about______. Click: Sample ending speech to know about the best ways to end your speech effectively. Hope the commencement lines above help you to make a good first impression in your speech or presentation. Remember you have to make a good first impression, because the first impression makes your image in mind of audience. You can click here to know how to give a good speech or presentation. thanks from the whole of you. You are welcome dear Neha. You are Welcome Ms. Nargis.